The Rocky Horror Picture Show is a long-standing tradition in Pittsburgh, where it has been running (on and off) since the late '70's / early '80's. The first cast, known as the Cast With No Name, performed at the King's Court Theater in the city (which is now the Beehive, a coffeehouse of local reknown). The Cast With No Name stuck with the show through trials and lineup changes and through its move to its current home, the Hollywood Theater in Dormont, PA (a suburb of Pittsburgh) in the mid-to-late '80's. It was at the Hollywood that the cast first became known as the Junior Chamber of Commerce Players, or J.C.C.P., for short. The name, as most Rocky fans are aware, comes from Janet's line "This isn't the Junior Chamber of Commerce, Brad!" right before "Sweet Transvestite." Since that time, the cast and show have gone through numerous changes in lineup, organization, and general quality of the show. We've weathered many ups and downs and have switched theaters two more times: once to the Squirrel Hill Theater and then back to the Hollywood, which will always be our hearts' true home. We've also gone through name changes - the Rich Wierdoes and the Satanic Mechanics - before reverting to our original J.C.C.P. recently. We've also been through it all as far as audiences and theater conditions go. The King's Court and Hollywood are both huge, gorgeous theaters, while the Squirrel Hill screen was small and slanted, with no performance space at all. Our numbers have gone from 200+ per night to 30-60 per night and back to 200+. We recently went through some extremely difficult times during which the cast almost broke up (and we gave Sal and the Fan Club more than their fair share of headaches as a result... thanks for putting up with us, guys!). But, like the phoenix, we rose from the ashes of our own self-destruction and started over. And the cast and show is better off for it. If there's anyone out there having severe problems in their own show, we just want to tell them to stick with it, because Rocky has a way of taking care of itself. It'll be around - and with luck and patience, so will all of us - for a long time. Perhaps the biggest highlight of our cast was the famous (or infamous) "Tag-Team Frank" episode, during which our Janet, Jesse, fell and was injured during "Planet Schmanet." 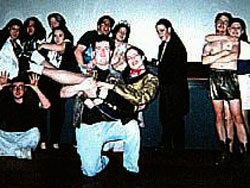 Mike, who was cast director and also Frank that night, stopped to attend to her, and Jason and Sara (Riff and Magenta that night) jumped in to fill the appropriate roles. Soon Mike came dashing up the aisle and "tagged in." Jesse was out of the show for the rest of the night, so Sara remained as Janet and Jill, a then-ex cast Magenta and Columbia, filled Sara's shoes for the walk on. Though it sounds convoluted, the audience loved it and it went over without a hitch. 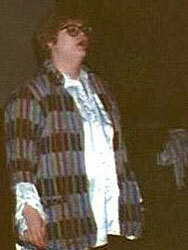 Jesse (happily) was not seriously hurt, suffering only a bruised knee, and Jill subsequently rejoined the cast. The Pittsburgh cast has been through it all, and we hope that our own perserverence can be something of an inspiration to others. But we couldn't have done it without the support of the Fan Club and, of course, our audience. We want everyone to know that we're still out here, back at the Hollywood, and with a gorgeous print of the film complete with Super Heroes! The price is only $3.50, so pop in and see us. We promise you won't regret it (Virgins come prepared to be embarrassed)!